Reduce your time and hassle with Premier Parking. You’ll get in and out of the parking lot more easily, which means more time spent enjoying the festival. Premier Parking is in Lot 1 on the northeast corner of W Church Street and Rio Grande Ave. The entrance to the lot is off W Central Blvd (north end of the lot). GA lots open at 10am, and parking will be available in multiple lots surrounding the venue. Space is limited, so be sure to carpool, and come early to avoid delays! Note that parking is at the vehicle owner’s risk. Payment is cash only—no debit or credit cards will be accepted when entering the lot. Additional paid parking is available in several Downtown Orlando parking garages. A complimentary shuttle service to and from the Downtown Orlando area is provided. Accessible parking is available in Lot 7 off W South Street. A valid ADA license plate or hang tag is required for entry. 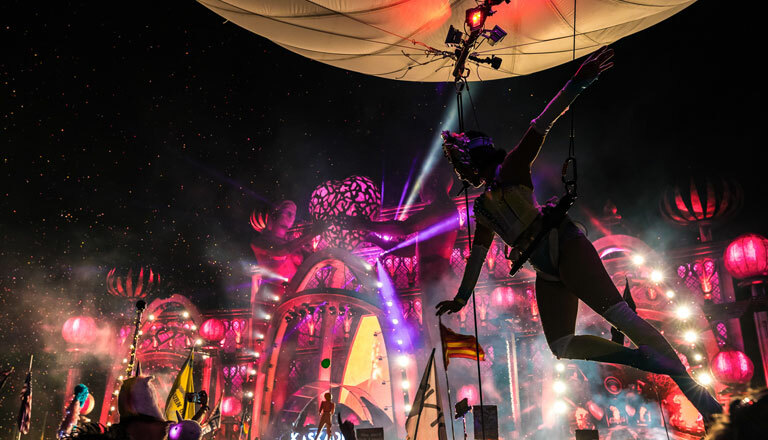 Learn more about accessibility at EDC Orlando. Don’t miss a beat! For easy entrance and exit, head to the Uber Zone. Just look for signs for our dedicated Uber drop-off and pick up lot. The Uber Zone is located at 2019 W Church St, Orlando 32805, on the corner of W Church St and S Tampa Ave.
For taxis and all other drop-offs and pickups, use the taxi lot on the northeast corner of Rio Grande Ave and W Central Blvd. Vehicles must vacate the parking lot each day at the close of the festival. Any vehicles left in the lots past 2am will be towed at the vehicle owner’s expense. To retrieve a towed vehicle, call Johnson’s Wrecker Services at (407) 295-9587. Please carpool or rideshare if possible. It’s not only good for environment, but it will minimize the number of vehicles accessing the grounds and help get you parked and into the festival faster! If you do drive to the venue, plan to arrive early, so you can take care of parking and get into the festival without missing a beat! Please follow directions from event staff. This will help ensure smooth traffic flow and faster parking. Be sure to remember where you park your car! Pin your location and take pics of nearby landmarks and signage. Don’t leave valuables in your car. Leave them at home, or carry them with you.